At WebOffset we take care of all your large volume printing needs from prepress to finishing and mailing if you choose. The last step in the process comes when it’s time for your product to ship. As with all the other steps along the way, you can count on WebOffset to ship your print job efficiently. There are many shipping options available and our experienced staff can help you choose the right one for you while keeping cost effectiveness in mind. Shipping options include various common carriers such as UPS and Fed Ex. For superior service we have our own delivery trucks. Our team works hard to meet all delivery deadlines utilizing the most cost effective shipping rates. Your product can be shipped standard service or time specific. Deliveries can be made anywhere in the continental United States or abroad. 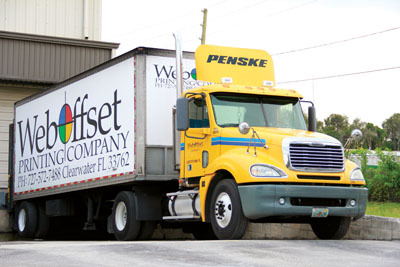 Our own trucks make deliveries throughout the entire state of Florida. With the support of our Bindery and Pressroom departments, jobs are palletized and most jobs are delivered within 24 hours of completion. Lift gate and hand unload services are available. Just because your job is through printing, doesn’t mean the job is completed. Trust WebOffset Printing to see your job through to the end with cost effective and efficient shipping.